This Is Getting Old: Who Is Freddy Gonzalez? 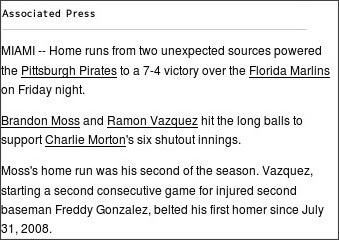 According to the AP, the Pirates second baseball is Freddy Gonzalez. C'mon people, I know you don't watch the Pirates but Freddy Sanchez is a former batting champion and two time all-star (soon to be 3 time). Even casual baseball fans know who Sanchez is. But not sportswriters. Jokes. What does it matter, he'll probably get traded anyway with everything else.